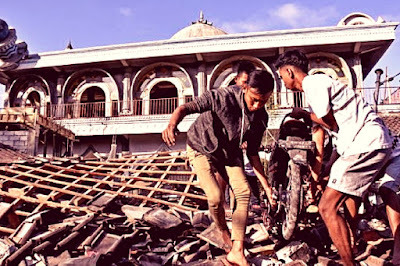 Lombok Earthquake has remained deep grievance in everyone’s minds and hearts, especially the locals. Earthquakes after earthquakes shook the land and ruined buildings and everything. BNPB (Indonesian National Board for Disaster Management) have confirmed until Thursday, August 23, the number of victims are 555 people dead and 390.529 others are now staying in refugee camps (Kompas.com). 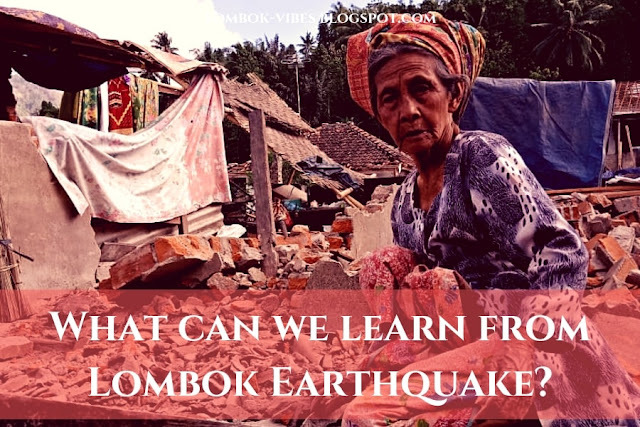 Now it has been more than a month after the Lombok earthquake, the situation is slowly back to normal and something comes up on my mind that I really want to share with everyone. It is about lessons that we can learn from this disaster. We may think that a natural disaster is not an excuse to give up. There must be something that we can take in everything happened in this world. I have listed some and also put my own thoughts. On the aftermath of the first quake July 29 in Sembalun, I got many notifications on my phone about the earthquake. Videos showed people were running outside their houses, babies were crying on their mothers’ arms and victims that were carried out of the pieces of ruined buildings with blood and scratches on their skins. While on other videos shown the climbers on Mount Rinjani were running down the rocky and dusty track avoiding landslide that occurred just after the quake. Some of them made it down to the village and the rest were trapped on Segara Anak lake. The situation on that day was shocking for everyone. I saw the buildings ruined down the ground and people with blood on their bodies. It was not the end, hundreds of aftershock occurred until the 7.0 magnitude shook the island for the second time on August 5 at 19.47 pm a week after the first in late July. 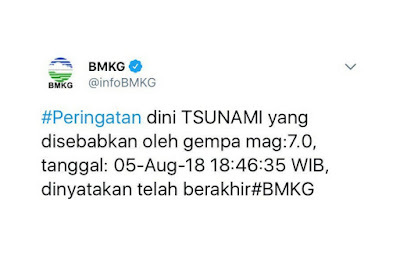 It was followed by early tsunami alert by BMKG (National Climatology and Geophysics Agency). The warning lasted for about 20 minutes until it was revoked. The effect of the tsunami alert was out of prediction. People poured down the street and headed to the higher ground. In Mataram nearby ex-harbor Ampenan people crowded the street and headed to the east side avoiding the coast. While in Lembar were the same. Panic and afraid of the tsunami have turned my village into such a nightmare when people were gathering and heading to Batu Idung hill because it was the nearest high ground they could reach. In the end, the police officer finally came and asked people to come back to their houses due to tsunami alert was already revoked. The earthquake has become the world’s concern and emerged acts of humanity. Many supports and help are addressed to Lombok from around the world by hashtags #PrayForLombok on Twitter and Facebook. About thousands of people are now staying outside their houses and so are the help of goods and stuff such as tents, blankets, foods and drinks, medicines and many more distributed to fulfill their needs. I personally, as a people who live in Lombok feel so grateful for those who have sacrificed their times and energies to help us raise and shine again. People are gathering and hands in hands to raise this beautiful island in the name of humanity. There are no boundaries anymore when our brothers and sisters are in needs. That what makes hundreds of volunteers come and lend their hands. These acts have opened our minds and hearts that we are not alone. Lombok is not alone. The earthquake has forced people to stay in refugee camps for unspecified times, I guess for the next couple of months. And since the earthquake occurred in the late of July and August, it is the moment of Independence Day of Indonesia. With the spirit of Independence Day, the refugees are strengthened by involved in the August 17 Flag Ceremony. It showed how the disaster could never break the unity of this country, especially Lombok island. It is also a good moment for us to unity and strengthen our brotherhood and help those who in needs. I found out so many hate speech and provocative posts on social media that put the government as the guilty side that deserved to be blamed for what happened. And it has created a not conducive situation. As the results people argued and put each other down. What makes me feel so sad is also some people that stated as if the disaster was caused by the negligence of the government. I will say it was the most idiot thoughts I have ever heard. Earthquake should not be seen from one side. Okay, it has damaged major facilities and houses and forced victims to leave their houses, but on another side, it strengthened our togetherness and unity. With that perspective, I ask everyone to take it as a lesson. Unity is needed to make Lombok raise up again. The government will help with the maximum effort and people are needed to support them. It can be seen with tons of materials and hundreds of young engineers are called to help to rebuild safe and strong houses for refugees. Indonesian Tourism Minister, Arif Yahya stated will apply Triple A-Frame in recovering Lombok post-earthquake. It is Access, Amenity, and Attraction (Okezone September 1, 2018). Access is the very vital object for a touristy place like Lombok. That should be the first concern in order to make any bits of help and distributions come easily. A month after the earthquake there are still many places that cannot be reached by help distributors and volunteers. So are the amenity and attractions. Some hotels and resorts in Senggigi and North Lombok are now open for guests. Speed recovery is attempted to make tourism activities back to normal. The three gilis in North Lombok is an icon for Lombok tourism also damaged. With triple A-frame, it is aimed to renovate and recover damaged attractions. In Gili Trawangan the locals have come back and started to open their shops. Some foreigner communities also involved in rebuilding and repairing damaged areas. The data showed that Lombok is categorized as earthquake-prone areas because of two types of the tectonic plate surrounded the island. That means the occurrence of the earthquake in Lombok is high. 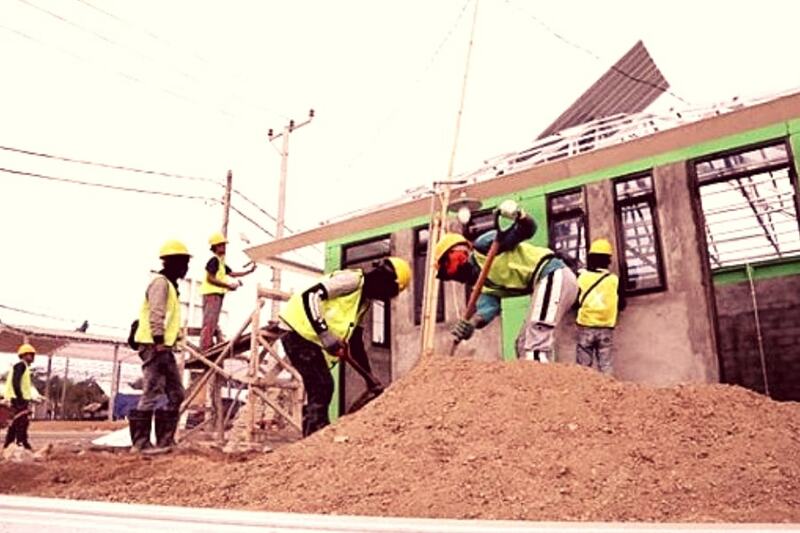 According to the data above, it is important for local government to socialize step-by-step of earthquake mitigation and tsunami simulation to the local people. Especially those whose living nearby the coasts. Natural disaster mitigation will cover the building reconstruction standards and anticipation in facing the effects being occurred. It is aimed to reduce the risks of victims. Earthquake and tsunami mitigation is necessary since Lombok have significant records of earthquake occurrence. The 7.0 magnitude on 5 August was enough for us to raise awareness of the importance of natural disaster mitigation. Furthermore, two tectonic plates beneath the island should have been our concern to put more effort into socializing knowledge about earthquakes. The damaged caused by the tsunami in Japan was massive and even caused some nuclear reactor collapsed. If they could not handle it well, numbers of the victim might be raised. But Japan has been shown that the right and quick actions to the disaster have finally recovered damaged areas rapidly. At least we could do the same without waiting for the next issues which may potentially emerge after the earthquakes. 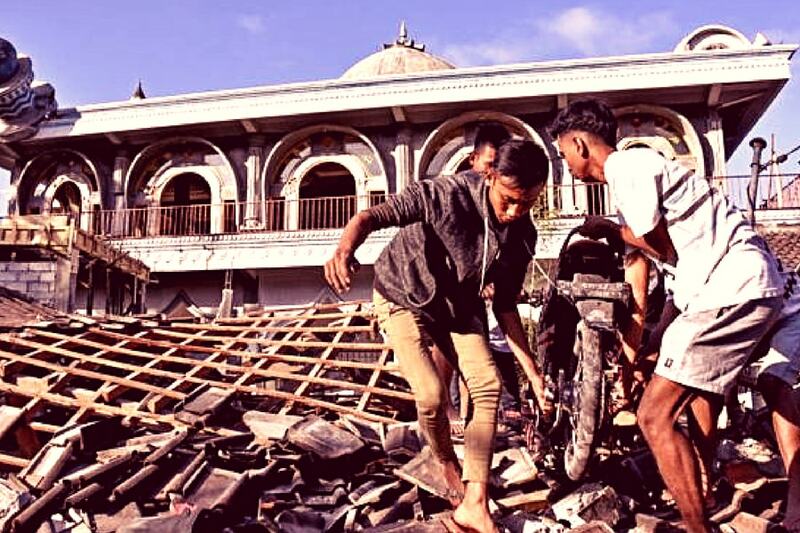 A researcher and geologist from Brigham Young University, Ron Harris in 2017 have revealed the potential tsunami-triggering earthquakes in Indonesia. He says the tsunami occurred in Aceh 2004 may potentially happen again in southern islands like Java, Bali and Nusa Tenggara. The research results were obtained from ancient tsunami sediment conducted in 2016 in southern regions of Java, Bali and Nusa Tenggara (Netralnews August 4, 2017). Harris also gave an illustration of tsunami-triggering earthquakes that may potentially happen with term “20-20-20”. The term is each for maximum 20 seconds earthquakes, 20 meters height of tsunami and 20 minutes duration to reach the shore. Tsunami speed is predicted can reach the coast with 620 km per hour and the community has 20 minutes for evacuation. This finding can be very useful and helpful information to be socialized to our community. Education curriculum should have included it as well to raise awareness. It can be followed by simulation for students in schools to give them more knowledge of how and what to do when earthquakes and tsunami occur. BNPB Indonesia actually has several natural disaster programs, as far as I found on their website, that includes post-disaster evacuation procedures. The programs and procedures are now necessarily needed to avoid risks of the bigger number of victims. One thing that has a major role during the chaos and panic situation on August 5 was misleading of information. 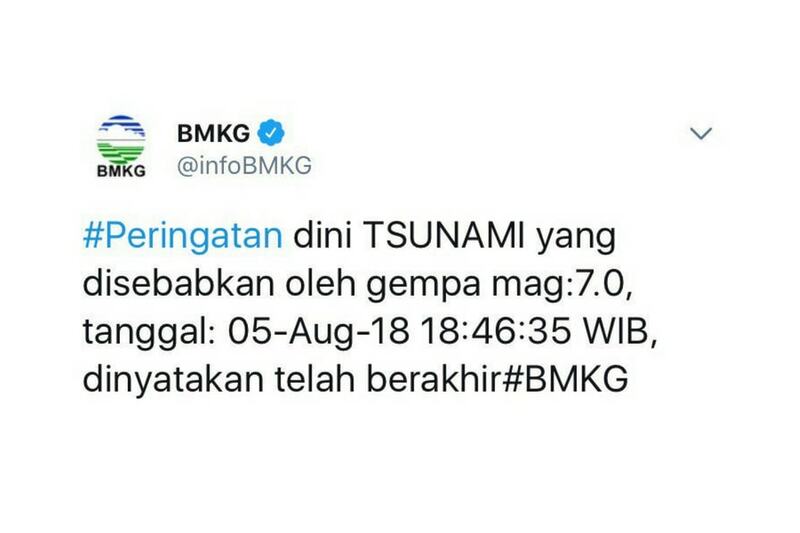 BMKG actually issued early tsunami alert at 8.17 pm and then ended at 8.25 pm. Not long after that alert, people poured down the street and caused massive traffic in Mataram. The alert lasted for about eight minutes but already led situation to be spooky and panic in most areas. I was panic as well at that time and felt the situation was like the tsunami would hit my place. There were some people who said the sea water already reached the whole Lembar harbor while my place is about 10 minutes from there. In fact, there was no tsunami like people were worried about. The right educational method needed to avoid other misleading information. 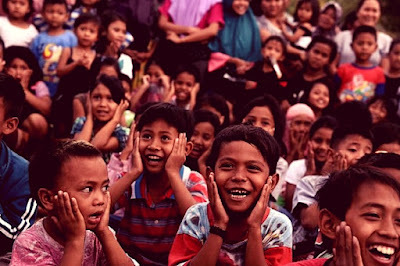 Since Lombok has categorized as earthquake disaster-prone area, the community should have been educated with disaster information. As I mentioned earlier that tsunami and earthquake mitigation can be applied in education curriculum and also regularly involved the community that lives nearby the coast in tsunami simulation. Additionally, a natural disaster can never be predicted and nobody can. The earthquakes have remained deep sad and grievance in our minds and hearts but it does not mean we stop moving on. The earthquake has left both positive and negative values that we can take as lessons and warnings. Lombok will be even strong with people that have been showing their humanities, unities, and cares. After all, I do hope Lombok can be even stronger than before. The earthquakes have given such valuable lessons for all of us that Lombok is not alone. We stand with Lombok and together we build it up again as the most beautiful place in the world!